Oda Nobunaga, Toyotomi Hideyoshi, Tokugawa Ieyasu: these are the names of some of the greatest figures of the Sengoku, or "Warring States," period in Japanese history, a time of civil war in which rival daimyo struggled for positions of dominance as they attempted to re-unite Japan. 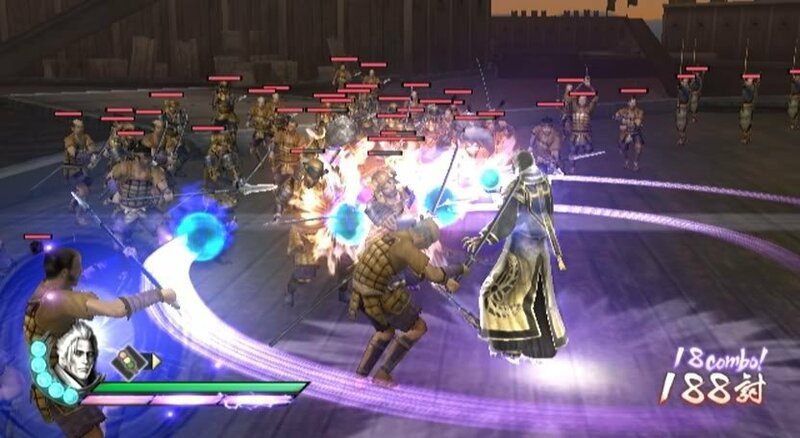 Though Koei has produced many games set during this rich period of larger-than-life figures and epic battles, they've primarily been strategy games like Nobunaga's Ambition, so the Samurai Warriors series ("Sengoku Musō" in Japan) is a bit of an anomaly, but a welcome one, placing players in direct control of these historic personages as active participants in their battles. Aside from the genre, what makes this game special is that previous entries in the series appeared on the PlayStation and Xbox, so Nintendo has definitely scored a coup in getting any kind of exclusivity for this third game on the Wii. It clearly believes in the title because it's not only being published worldwide, but Nintendo is handling the publishing duties itself, even contributing to the inclusion of a mode based upon a Famicom Disk System game never seen outside of Japan. As with Capcom's eminent monster-hunting game, the Classic Controller is strongly supported and Nintendo even went so far as to bundle a special version of the CC Pro with the game's title emblazoned on it when it was released in Japan. The Remote and Nunchuk can be used as a viable alternative and even the GameCube controller is supported, though we preferred the button layout of the Classic Controller Pro, which is also indicated as the preferred method of control in the manual. Whichever control option you opt for you can freely remap the majority of actions across all available buttons via settings in the "Dojo" menu. Though the controls at first appear to be some of the most complex seen on the system, in fact the majority of gameplay will only see players using a handful of buttons regularly. Learning the controls is aided by on-screen prompts, and menu options change depending on which controller you're using as does the presence of a control reference in the in-game pause menu. 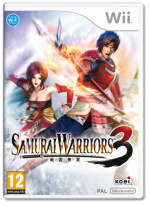 On the surface, Samurai Warriors 3 appears to be a 3D beat-'em-up with players controlling a single character and fighting all comers, but this isn't really the case. 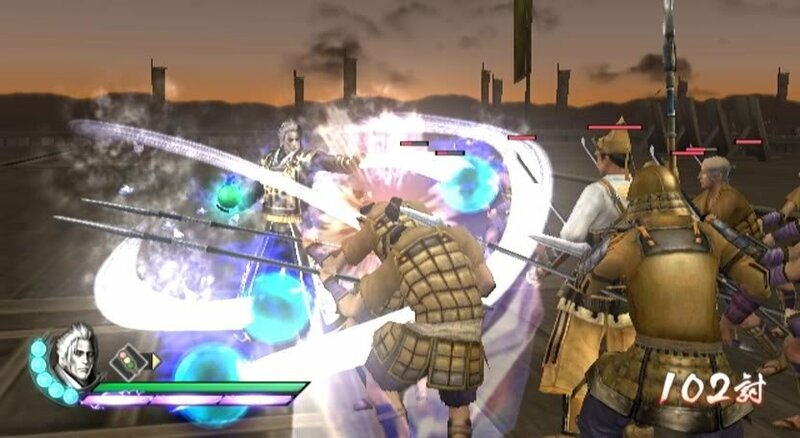 Though it's true that players control a single character imbued with super-human combat abilities who can cast multiple opponents aside with ease, the strong strategic elements and explanation of the historic setting clearly mark this out as a Koei game. The main mode of play is Story, in which players choose one of dozens of characters and play through a short series of battles interconnected with animated cut scenes that serve to explain their place in history. Each of the five battles takes place along a time line which brings the character closer to his (or her) destiny. You're shown a map and given a battle plan, including major objectives and conditions for winning or losing. There are also several side objectives which will give players bonuses such as special weapons or armor, extra currency for buying unlockables or gems for upgrading weapons and other equipment at the blacksmith between battles. Once you've looked over your mission objectives you can select equipment such as your weapon, armour, gauntlets and boots, all of which have effects on attack, defence and special abilities, and there's a range of items with different tactical applications too. Difficulty can be set at one of four levels on a per-battle basis, allowing players to experiment and see what level of challenge they're most comfortable with. 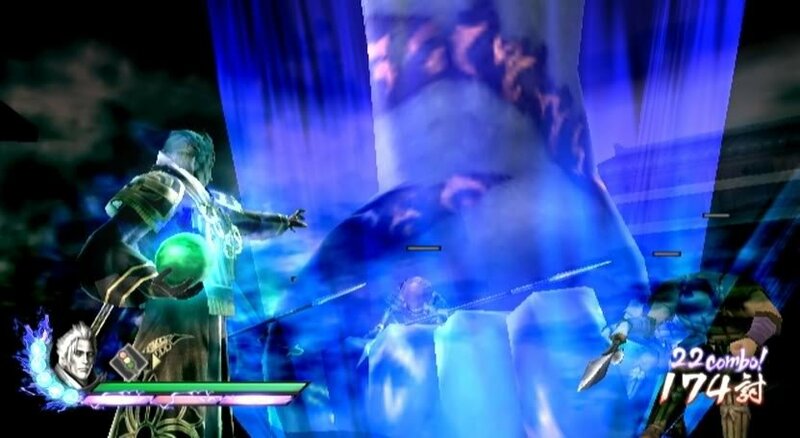 Combat is as simple as pressing your main attack button over and over again in order to chain regular attacks, but you'll quickly want to exploit your Power Attack, Spirit Charge and Musō Attack in order to smash through masses of foot soldiers and, more critically, take down named enemy generals to achieve your required and optional objectives. Each battle will have an undisplayed time limit of an hour or so, but in practice you can complete a battle in as little as 20 minutes depending on whether you attempt side missions. In many cases one of your generals falling will end the game, so you won't often be able to dilly-dally. However, as long as failing an objective doesn't also meet a defeat condition, there's nothing requiring you to succeed in all of a battle's goals. The optional "tactical" objectives will provide specific strategic benefits that will assist players during the battle. Though you may only be controlling one character, battles are fought on multiple fronts and other allied generals will have their own roles in the battle, so choosing to eliminate an enemy general, which falls outside of your main objectives, in order to potentially gain reinforcements can be quite desirable. Side objectives aren't always that easy to pull off and frequently have a time limit or combo requirement attached to them, encouraging future replays to get those extras or improve your score. There's constant chatter from allied and enemy generals as well as status updates to tell you when your notable allies are in trouble, have been defeated or have taken down a named enemy themselves. You'll often need to decide whether or not to break off your current engagement to assist and sometimes objectives will change during the course of battle due to unforeseen events, so it's good to pay attention to these communiques and pause to review objectives. Though the controls are deceptively simple the battle system is quite varied and complex, allowing for the exploration of a variety of play styles and tactical approaches as you go. Most of the battles take place outdoors so you can summon a steed and fight from horseback to cover ground more quickly to fly to the aid of an ally in trouble, though fighting on foot will give you greater flexibility in the execution of special attacks. As your character increases in experience different power attacks become available which are executed by chained normal attacks followed by a single press of a power button. These become incredibly varied with combos of two to nearly a dozen sequential attacks each triggering a different special attack. Your musō, or "ultimate," attack does the most damage as you'd expect, with Ultimate Musō dealing the most damage, accompanied by a special animated sequence. In addition to their own forms of attack, characters can trigger "skills," which might be as simple as increasing the amount of gems earned in battle or extremely powerful like the generation of a temporary aura of invulnerability. Visually this is a fairly ambitious game that uses clever tricks to compensate for the Wii's limited memory and processing power compared to other consoles of the current generation. Most of the battles are fought in walled-in areas that are almost like open-air rooms. Draw-in isn't too bad, with optional health bars over the heads of soldiers advertising their presence before they're clearly visible. People you need to defeat as objectives have the word floating over their head in white, with tactical objectives similarly indicated. More minor named characters will also have their names shown and provide additional armour or weapons in reward for their defeat. There's also plenty of eye candy with musō attacks and special attacks which are tastefully over-the-top and fantastically executed. The characters themselves are finely detailed and have some rather exquisite designs – truly befitting their legendary, semi-mythical status. PAL gamers will be disappointed at the lack of 480p or indeed any 60Hz option, however the widescreen presentation is good and the 576i image on our 42" plasma couldn't be faulted. The number of enemies on-screen is quite impressive too: you can be facing scores of soldiers, though few of them will actually attack at any given time. You can rack up a truly impressive body count, easily into the hundreds and beyond in a single battle, though other than the odd samurai, bomb-throwing ninja or rifleman, few of them will pose any real threat. 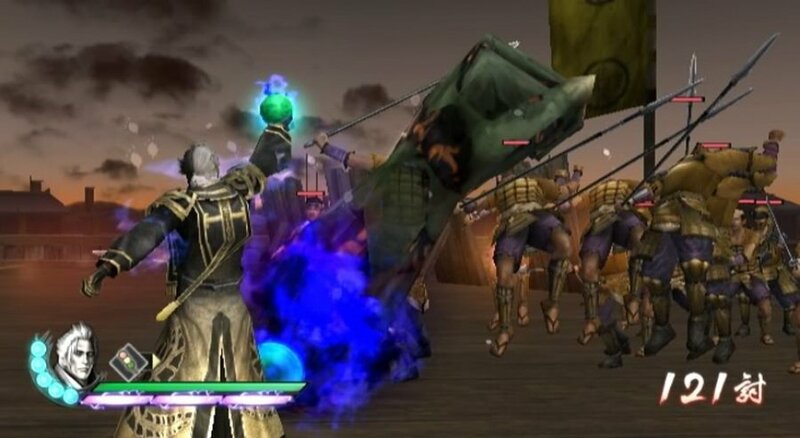 Players used to being able to overcome most of the opposition with little effort in Easy and Normal will find the Hard and Chaos difficulties a rude shock, as you can easily be taken down by a single combo attack from a minor named enemy, so learning to block and evade will be crucial if you've neglected them previously. Given the large and often convoluted battlefields, it's not hard to get lost even with an ever-present map. This is partially because some avenues are blocked and partially it's because you'll be looking at a lot of open gates with green fields beyond that can start to look the same. You'll want to refer to your map often and use the ability to pop-up a zoomed-in translucent version of it over the centre of the screen to get your bearings, but when you're in a battle at dusk or in the evening with more than one possible elevation – as on ships or inside of castles – don't be surprised if you're doing a lot of back-tracking and running around just trying to figure out how to get where you need to go next. As nice as the character animations and special effects are there's also a great soundtrack combining modern cinematic pacing and electronic effects with traditional Japanese themes. Purists will be happy to note that there's an option for the original Japanese voice track, though we preferred the English casting choices for the narrator and Oda Nobunaga. The only parts that are subtitled are the historic narration, cutscenes and in-game commentary, so unless you understand spoken Japanese you'll be missing out on the amusing intro and victory utterances of your chosen hero if you opt for the original soundtrack. If there wasn't enough to do in Story, with a few dozen characters to unlock (all but seven having their own stories), you have an additional three modes to try. You can play through any scenario with any unlocked character in Free Mode or create a custom character (you can save up to 20) to play through all the battles in chronological order in Historical Mode, which will feel even more fresh due to having different objectives from the Story. Special to this sequel is Murasame, showing Nintendo's interest went beyond that of mere publisher. This 3D re-creation of the 2D classic allows players to use any unlocked character or one of their own creation to lead a group of peasants into Murasame castle to find the source of demons that have appeared in the land and free the trapped spirits of tanuki to earn rewards of gems and rice. A nice extra is the appearance of the hero from the original game, Takamaru, which might also lead to the eventual release of Mystery of Murasame Castle on the Virtual Console. Players with friends will be happy to note that all modes can be played co-operatively with two players via local split-screen multiplayer. When you play with a friend one of you can use a custom character in Story (otherwise limited to built-in characters), and a special Double Musō attack is possible. As if that wasn't enough you can play Murasame online via Wi-Fi Connection with friends or partner randomly with people in your own country or worldwide. Best of all, as with the other modes, rewards of rice and gems earned in online quests are added to your offline pool for unlocking characters and weapons or upgrading equipment, resulting in a game players can enjoy for a very long time. 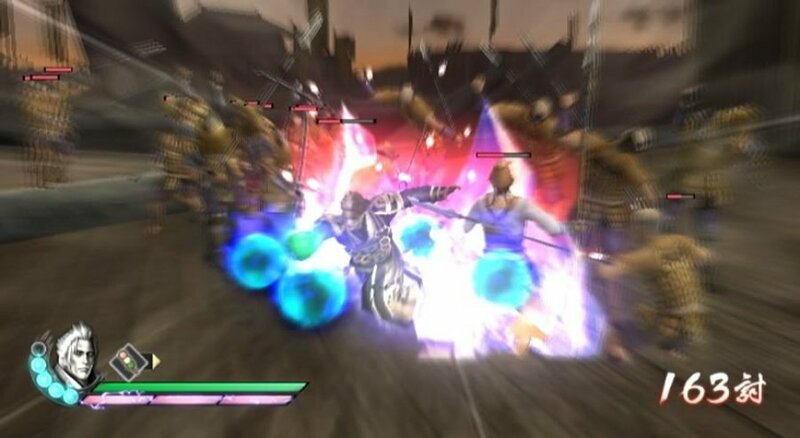 Despite occasionally getting lost and feeling overwhelmed by all the options and moves, Samurai Warriors 3 is a real treat and it's easy to see why Nintendo secured it exclusively for the Wii. Although there is a ton of content, the gameplay is structured in bite-sized pieces so players can make some serious accomplishments in a short span of time. With dozens of characters to explore and upgrade through four game modes, it's a game you can play for a very long time without feeling like it's taking over your life. If you have an interest in games with a strong historic flavour and a mix of action and strategy, it's definitely a game you'll want to check out. Awesome. I've been looking forward to this one, and I'm glad to hear it's good. ONM said it was just a mindless button basher and would make your thumbs hurt if you played it for a while. I wasn't planning on getting this, I was just wondering if it ever felt like this to you. No, I absolutely disagree that it's mindless. When you have enemy generals blocking attacks you cannot break through with normal attacks so you need to pay attention to your power combos. It's definitely a beat-em-up style game so you are pressing attack a lot, but there's variety in your attack methods and you have that flexbility around how much time you want to spend mowing down the fodder versus getting the objectives sorted. I think there's a good balance there and obviously I quite enjoyed it. TvsC I got the thumb callous - not this game. So... I dont have time to read it... is this game like Dynasty Warriors? kinda looks like it. Last time I played a Dynasty Warriors game I got bored and frustrated. There are very few real enemies and a ton of humanoid furniture. Also, I was in doubt of picking this up because of ONM review and like Sean, I do not agree that mindless button mashing will take you very far in this. I really hope we get Nazo No Murasamejou. I've wanted to play it for several years now. Yes this game does appear to be a Dynasty Warriors spin-off, though you only control the one character with a 3D camera placed behind them. Never heard of this one before. Looks like I would like it. Will try and track this one down in the future. Nice review, Sean. Apparently coming to the States in the fall so watch for it! I've been wanting this game for so long, it's just a shame that it still won't be out till the fall. Great review though! So Koei's still beating the dead horse? This is what, the 20th game using the Dynasty Warriors formula? I didn't even know about this game. Am I slipping in my old age? I'm keeping an eye out for this one. Honestly, reviewers should stop talking about the wii "limits" compared with the HD consoles because is just absurd and pointless. what do you expect to accomplish with that? We all know that the wii is not HD and yet that's not a shortcoming in any sense. The wii has good hardware and being HD or SD is not circunstancial at all. Why not mention it? The series spent time on the other consoles and people are going to want to know how it stacks up. @buffalobob: My comment has nothing to do with graphics, but given games like Dead Rising have been noted for being bereft of enemies compared to the consoles they originally appeared on I thought it was worth noting that despite well-known limitations in the system's memory there's an awful lot of enemies on-screen at once. You will never here me say a game "look good for a Wii game," but I do think it's fair to be impressed by a feat like that! I definitely can see this is a marmite kind of game, but you know once in a while I like me some marmite! I ordered this game, but haven't received it yet. Few retailers seem to have it around here, which is strange. I liked the sound of it: beat-em-up with some tactics, loads of enemies on the screen at once and two player co-op in the whole game. And this review assured me the game is what I think it is, so I'm really looking forward to it now. Bah, another Koei action slogathon. What ever happened to the good old days when Koei was the unsung king of console strategy gaming? Now they mostly just make Dynasty Warriors and its clones. )=< Though I guess they still put out the occasional strategy game every once in a while. Would be nice if they got more publicity, though. This sounds amazing and really fun. I'm gonna get this soon. Definitely need to rent this one. Is this the US version of Sengoku Basara ? I watch the Anime so it would be nice to know familiar faces to those historic japanese figures. @Senri: No, Sengoku Basara is set during the same time period and features some of the same characters, but it's from Capcom and seems to have more of an action-oriented focus and is more over-the-top in character design and execution. That game is also multi-platform, so if you have a PS3 or Xbox you can get it; the inclusion of a mode based upon a Nintendo property would seem to preclude Samurai Warriors 3 from appearing anywhere but the Wii - at least this version of it. Due to space considerations (just having re-read it, this is definitely one of my more "epic" reviews) I didn't go into much detail on the Wi-Fi mode. It's worth noting that it works better than a lot of Wii games in that it's not a standalone feature. Unlike a game like The Conduit where you go into online mode and sit in a lobby to start a game in Samurai Warriors 3 connecting to Wi-Fi is separate from the actual game modes and allows you to see whether or not your friends are online. Once you connect Wi-Fi, outwith the saving and loading parts of games you're always connected, no matter which game mode you're playing. This means a friend can start up their online connection, see that you're online too and then start Murasame Castle mode and send you an invitation to join them when you're playing Story Mode or a different game mode - finally! Of course if you're trying to do a random match up, that will mean sitting in a lobby, though it only waits 60sec. to make a random match before giving up and it's no better than playing any other online Wii game that way. Because of its niche nature, though online matches are more likely to be with people you know, so definitely check out the online gaming page for this game if you're interested in trading some codes! With all the controller options supported it would have been nice if the PS2 controller was one of them. The reason I say that is I used to play a lot of Dynasty Warriors on the PS2, and once this comes out in the US next week, I will surely pick it up. I'm totally gonna get this. I love Dynasty Warriors-esque games! I own Mystery of Murasame Castle on the Gameboy Advance. It was way to hard for me. I still can barely get past the first level. @Motang, the CC Pro is similar enough and yet superior - it's my weapon of choice and works a treat. Hey Sean, don't know if you're still checking up on this review but I was wondering what you thought of Sengoku Basara? Much better than IGN's review!!!!! @Sean_Aaron you are right the CC Pro is a very good controller, but too bad it's missing the rumble feature.